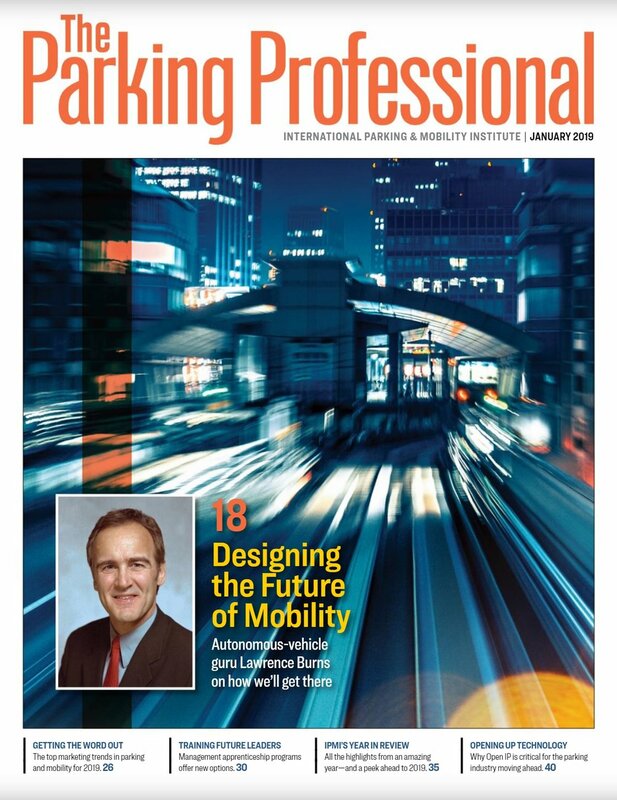 Premium’s senior leadership contributed a featured editorial article to International Parking and Mobility Institute’s monthly publication ‘The Parking Professional’, January 2019 issue. Brent Paxton is chief business development officer with Premium Parking and a member of IPMI’s Board of Directors. The article is featured below and you can read the full issue here. I RECENTLY SPENT SOME RECONNAISSANCE TIME discussing parking and mobility services with one of the most candid conversationalists I know— my soon-to-be-driving (with a learner’s permit), high school freshman daughter. As a typical character you’d see on a recent Progressive commercial (yes, I am turning into my dad), I spent considerable time trying to convince her that she doesn’t need to drive so soon—wait until you’re a senior, I advised. And with the evolution of autonomous vehicles, I continued, perhaps you don’t even need a driver’s license. With a roll of her eyes and the wit of her mom, she proceeded to share half a dozen reasons I would want her to drive in two months (and she was right). Further, she explained, while she certainly plans to use ride-share and driverless cars (when they ever actually exist, she mocks) for a variety of special occasions, there is no way she would ever consider relying upon them completely. And with that, she shoved her iPhone in my face with an article on Porsche Passport, the car subscription service program being piloted in Atlanta, our home city. She quickly turned on her Dad’s traits and started hard-selling the service and all the benefits it could provide to our entire family. Research over—I know when to walk away! While losing arguments with her happens more often than I care to admit, this exchange really got me thinking about knowing your customer. I think we all realize the future wave of our driving population will demand more and more frictionless parking technology and make payments ubiquitous across a broad multi-modal transportation network.But that customer is the obvious one. What about the growing list of new customers to our industry—the shared-service provider customers who consume parking traditionally but also want to buy parking inventory through different business models? Does an Uber or Bird desire the same parking service at the curb as an Amazon or Instacart delivery service partner? Will ZipCar’s service have different parking needs than a Porsche subscription service in a garage? And how does our parking inventory integrate with all these newcomers to the shared economy? When viewing the customer through this new lens, I began to wonder how well we truly know our extended customer base and, further, whether we care about that experience? My challenge to all of us is that we begin to realize the significant opportunity we have been given with the explosion of mobility services and recognize they, too, are our customers. We should want—dare I say need—to be able to serve them in both a professional and technical way. Let’s be certain to understand the particular attributes of our parking inventory and how it uniquely serves a broader customer continuum, making our customer’s parking experience an enjoyable one for every player involved.